Crazy Crocheter: YEY for Verena. 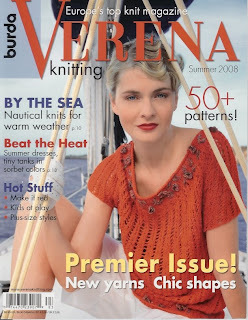 North American knitters can finally enjoy European designs from Verena magazine! My mother used to sew. It was common for women in the USSR because the choice of ready-made clothes was limited and not the best. By the time my sister was born my mom was so good that people had a hard time believing that the clothes we wore were handmade. Mom would modestly say that she is not a good seamstress (she was good, believe me), but rather she had good patterns and instructions. All her designes came from Anne Burda's magazine which was very famous in the Soviet Union. These magazines were staples in Russian households at that time. Women would lend their magazines to friends, trade them, copy patterns for others, and the lucky ones would actually get a xeroxed copy of an article (they were expensive and not all the issues were available). The beauty of Burda's designs were their timeless elegance and classiness so it did not matter if the patterns were a couple of seasons or even a couple of years old. My mom's magazines were carefully stored, and could be looked at at her presence, on a hard surface (to avoid any damage - after all they were simply stapled together), and only after I would have wash my hands. She did not like to lend them to people and did not allow anyone, but herself, to trace the patterns. Some of mom's friends would knit and they were the lucky owners of Burda's younger sister - Verena. Verena's models were always classy and were far from simple knitted socks and sweaters that grandmothers would make. At the same time, just like Burda's items, they seemed to be easy to make and had planty of instructions. 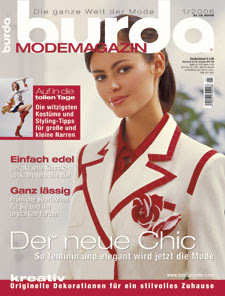 Another thing about all Burda's magazines is that their designs would fit a regular-framed woman, the one that has curves. However, for those who found them too big or too small there were easy instructions for adjustments of the patterns. 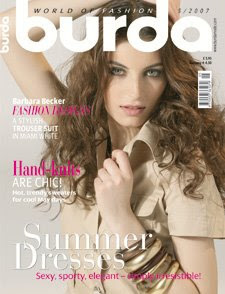 Five years ago I was contemplating the idea of sewing and the first thing I did, naturally, was to buy a Burda magazine. Just like in childhood, I would carefully flip the pages looking at designes and patterns, imagining which ones I'll do first. I was SO excited to have my own little collection of those precious gems. Unfortunately my sewing enthusiasm died after my first skirt; the process was too tedious and uncreative, but I believe I'll get back to it one day. 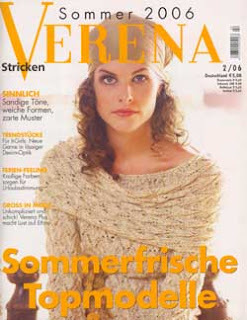 When I started knitting the first reflex was to buy a Verena magazine. I was very deceived that none of my favorite magazine stores or bookstores carried them. Moreover, none of the store-owners knew what I was talking about. I "googled" the name of the magazine, tried searching representatives, but could not find anything in Canada or the US. As it turned out, Verena was simply not available in North America until recently. The beginning of Summer marked the first North-American issue of "Verena". If you do not know about this magazine I highly recommend you checking it out - you would be pleasantly surprised with all the interesting and creative projects. Check the book, yarn, and magazine stores - I already spotted a copy in one of Montreal's yarn stores!